How wonderful it would be to becomethe owner of the finest balcony fence of the Netherlands, with our assistence ?! J & B Almelo is THE specialist for Frenchbalcony and gallery fences. All the activities will be coordinated by us, saving you time and money. Not only do we have a wide range of fencessuch as: glass fences, bars fences, slat fences, French balconies, balustrades and board fences, but also a wide range of: roof terraces, railings, canopies, stair fences, facade screens and privacy screens. We have more than 20 years of expertise, offer fences of high quality and use specialized and professional installation methods. 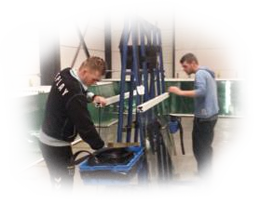 We carry out projects throughout the Netherlands, fromEnschede to Amsterdam. Other than these hours, it’s always possible to come by appointment.